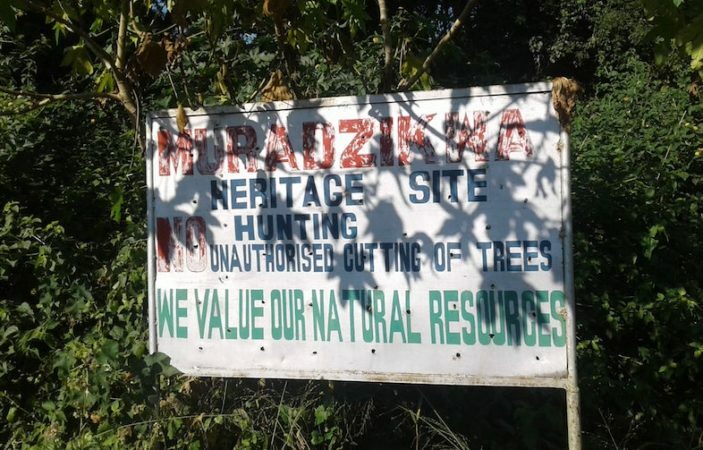 The Jersey Estate sits beside Mount Selinda on Zimbabwe’s eastern border, at the edge of the Chirinda Forest Botanical Reserve—the southernmost tropical rainforest in Africa. 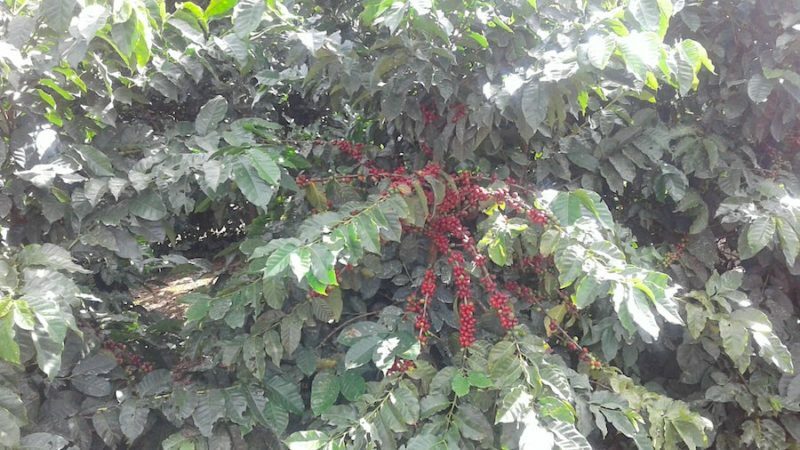 The estate was established in 1944, and coffee trees were added in 1980. Today, 430 acres of the estate are cultivated with the coffee varietals SL-28, Catimor-129 and Costa Rica-95. A huge amount of care is taken to pick only ripe cherries. Between June and September, each tree is picked over approximately six times. After harvest, the cherries are wet processed with a disc pulper. Fermentation times vary based on the ambient temperature and humidity. The people overseeing the fermentation process check for readiness by feeling the fermenting parchment. When it begins to feel gritty, it's ready to be discharged into the channel, washed and then density graded. 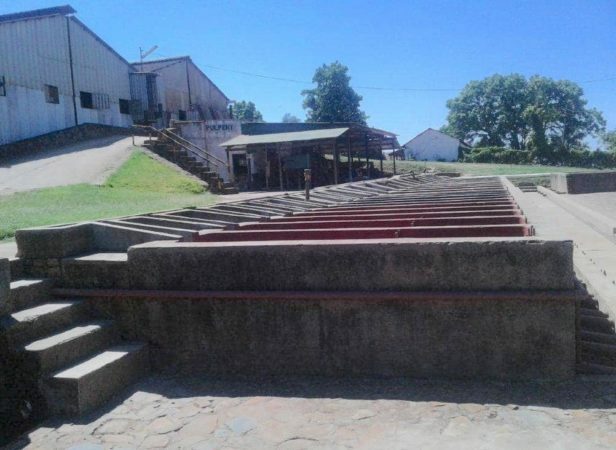 After wet processing, the beans are placed in cascade troughs around which air is blown for approximately seven days, to ensure even drying. Then, the beans in parchment travel approximately 55 miles to the Estate’s dry mill for processing. Water for growing and processing activities come from three rivers that run through the estate, the Chinyika, Chinyamakashu and Nyamukunga. The rivers flow into the Jersey Dam and are used to irrigate crops and for other activities on the farm, while four streams, the Fayekhlanda, Gezabahle, Nyamashato and Nyamurangwa, pass through the estate free flowing. 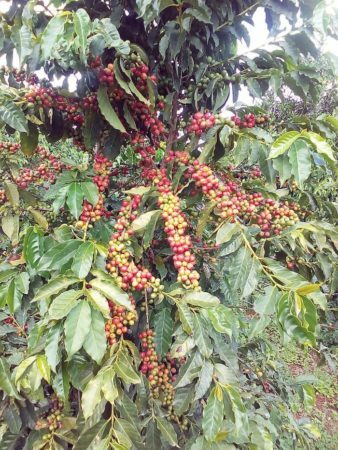 Average annual rainfall on the estate is 44.5 inches, and the coffee trees are additionally watered through gravity-feed irrigation systems from the Jersey Dam and holding dams on the ridges of the estate. To protect itself against blight and ensure the health of its soil, the estate hosts a rich diversity of species and crops. 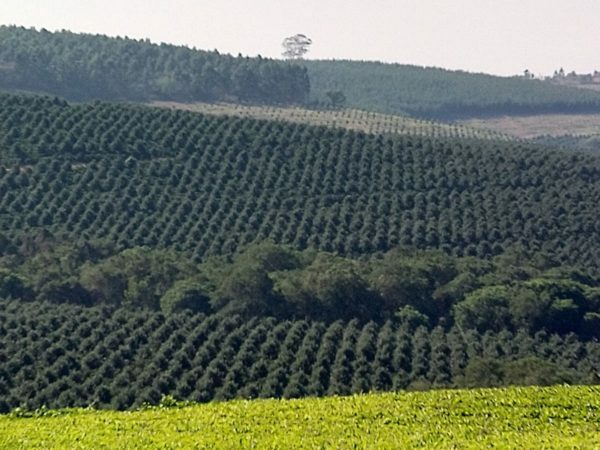 Eucalyptus timber, which is burned in the boilers of the estate’s tea factory, is farmed on 677 acres, and tea is cultivated on 1,502 acres. An additional 365 acres are covered with natural forest and river-related conservation areas. The final 644 acres are home to the estate’s buildings and facilities, including the Jersey Dam, factory complex, coffee wet mill, nurseries, housing, school buildings, clinic, sports fields and shops. 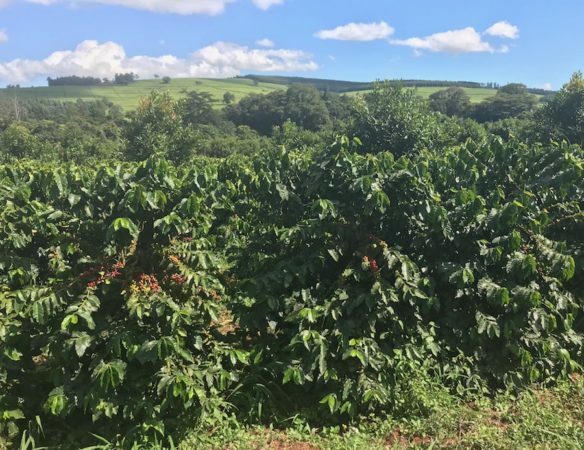 Macadamia trees, interspersed with coffee trees, also contribute to the estate’s soil health and economic well being. When the macadamia trees become fully mature (in seven years’ time) they will become the major crop on those acres. 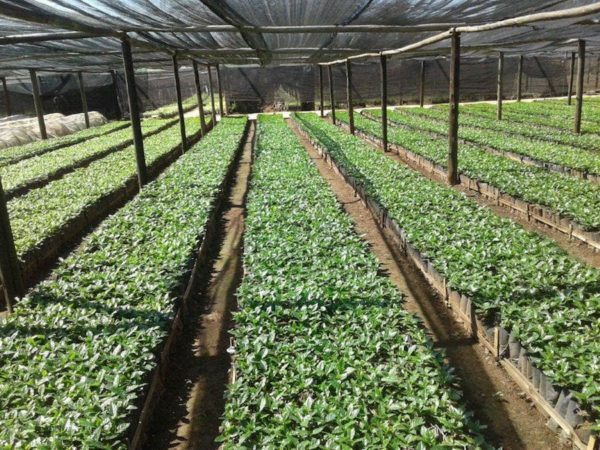 Meanwhile, new coffee trees are being planted in what were formerly eucalyptus timber fields. The estate has 23 permanent staff members and 92 part-time workers. During the harvest season, employment on the farm swells, as about 800 contract workers from neighboring villages are brought in to help pick. The estate maintains a strict age minimum of 18 and strives to conduct its hiring process as free of discrimination as possible. The facilities on the estate are extensive and support a wide range of activities and needs for the workers and villagers. There is a 13-bed medical clinic that is staffed by two nurses who are registered by the state and a doctor visits regularly. Six of the beds are in a male ward, another 6 in a female ward and a single bed is in a maternity room. The closest hospital is 9.4 miles away and, in the case of a referral to the hospital, the estate provides transportation both to and from the hospital. There is also primary and secondary schools that teach both the children of the employees and children from neighboring villages. 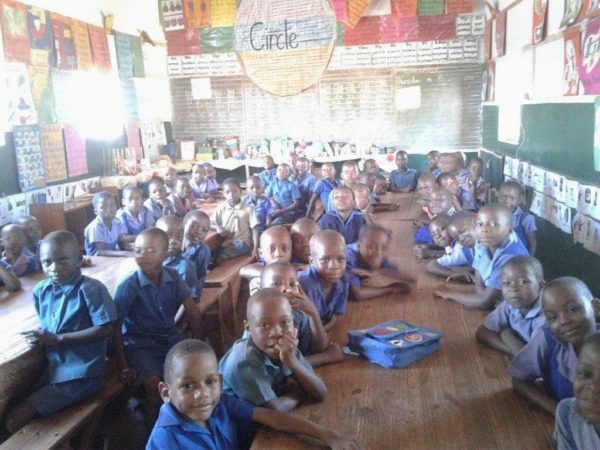 Approximately 1,000 children attend the primary school and 500 attend the secondary school. A recreational hall with sports facilities and television access is available to all employees. There are also sporting fields where organized soccer, volleyball and other sports are held. And, to save workers and villagers from the 33-mile trip to the nearest large town for basics, the estate also has a trading store, five kiosks and a large beer hall.